The recent propositions by Daniel de Paula seek to activate and exhaust a multitude of agents and relations in a given spatial context. Through an attitude that does not incarcerate itself in the field of art, thus being intersected by concepts from architecture, geography, geology and astronomy, his work critically amplifies the logics deducted from the very own behavior and history of objects and places. The operations employed by the artist suggest an indivisible bond between the objects presented and the actions that give them existence, presence, and significance. 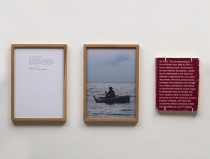 Through strategies such as negotiations with and within city structures and institutions, displacement of quotidian objects, appropriation of public infrastructure, and interaction with constitutive agents of the exhibition space and its surrounding landscape, his pieces, installations, and interventions attempt to disarticulate, reconstruct and resignify rigid and conditioned spatial and conceptual systems. Recent Solo Shows and Projects include: Gravidade, Edital PROAC, Cratera de Colônia, São Paulo, Brazil (2016); Open Plan, SP-Arte, São Paulo, Brazil (2016); SITU, Galeria Leme, São Paulo, Brazil (2015); objetos de mobilidade, ações de permanência, White Cube Gallery, São Paulo, Brazil (2014); Para estender um corredor, Galeria Cité Internationale des Arts, Paris, France (2013); Programa de exposições, Centro Cultural São Paulo, São Paulo, Brazil (2011), among others. 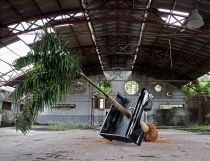 Recent Group Shows and Projects include: Arte e Ciência – nós entre os extremos, Instituto Tomie Ohtake, São Paulo, Brazil (2016) Esforço-Desempenho, Galeria Athena Contemporânea, Rio de Janeiro, Brazil (2016) Voragem da História, Observatório, São Paulo, Brazil (2105); Permanências e Destruições, Oi Futuro, Rio de Janeiro, Brazil (2015); la parte que no te pertenece, Galeria Maisterravalbuena, Madrid, Spain (2014); Onsite, TAP, Southend-on-Sea, U.K (2014); Open Cube, White Cube Gallery Mason’s Yard, London, U.K (2013); Processos Públicos, Paço das Artes, São Paulo, Brazil (2012), among others.